determined instead by how fast the computer can run your script. know exactly how Matlab spells the topic you are looking for. Any line in a script that ends with a semicolon will execute without printing to the screen. Try, for example, these two lines of code in a script or at the >> command prompt. see what y(x) looks like, just type plot(x,y) at the command prompt. on the left side, just above the command window. and place it at the upper right. from x = 0 to x = 20. The script then prints the step-size h and tells you that it is finished. 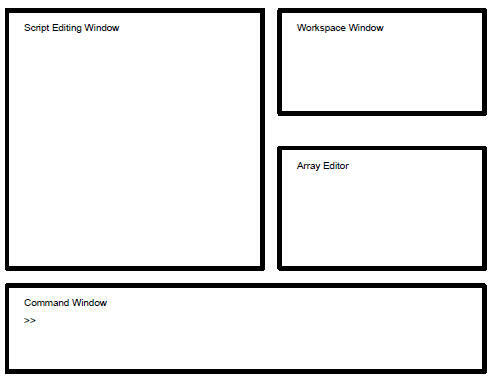 array editor just below it so that you understand what the array editor does. do this Matlab comes with two important features: breakpoints and stepping. above and either click on Breakpoints on the tool bar and select Set/Clear, or press F12. line on which it is set. use F10 to step through the script while watching what happens in the other windows. of chances to practice debugging this way as you work through the examples in this book. Note: e stands for exponential notation. Matlab knows the number π. Try displaying π under the control of each of the three formats given in the previous section. Note: you can set pi to anything you want, like this, pi=2, but please don't. assigns 20 to the variable a. It should come as no surprise that the Mat in Matlab stands for matrix. This makes the matrix look so nice in a script that you probably ought to use it exclusively. When you want to access the elements of a matrix you use the syntax A(row,column). For example, to get the element of A in the 3rd row, 5th column you would use A(3,5). how to handle strings type help strings.